This property was everything it was advertised to be and more. Nick sent us fantastic directions to the property. We flew into San Jose, but Nick’s recommendation to fly into the local airport would save a lot of time and driving. We enjoyed the 5 hour drive through the country, and it helped us to see how the little village of San Buenas was a typical Costa Rican town. We do recommend renting a car with 4wheel drive to get up the hill from the town. Walking down into the town is safe and a wonderful way to see real life. The hike back up is a little steep. Only one of us did this several times. The beaches are within 15-30 minutes of the house. 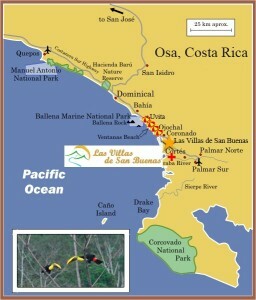 We spent time at Playa Ventana, Ballena, and Hermosa. The water was warm and none of the beaches were crowded. All the beaches were north of San Buenas, which took us close to the Mega Super in Uvita where we bought food for cooking. When we went south to Sierpe, we bought food in Palmar Norte. The fruit and vegetable “store” there was particularly nice, and the bakery had both awesome baguettes and a sweet bread (pan con leche dulce) that we bought for Christmas breakfast.